The Cubs Individual PECOTA Projections Don't Look Too Hot, But Are They Really That Unfair? 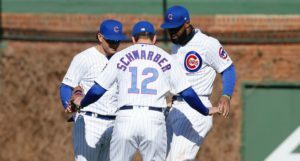 The Cubs Individual PECOTA Projections Don’t Look Too Hot, But Are They Really That Unfair? Who’s ready to be really angry at an inanimate projection system that’s simply doing its best to objectively and conservatively forecast individual player performance for the upcoming season, separated from our personal opinions and rooting interests in those players?! Me, too! I like being angry! 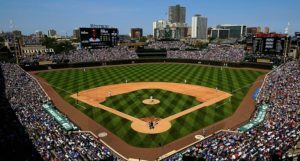 Baseball Prospectus has just released their annual PECOTA projections for the upcoming season, and, as Brett has already explored at a macro-level, they do not like the 2019 Chicago Cubs. Indeed, by this system’s forecast, the Cubs project to finish not first, not second, but THIRD in the NL Central next season with only 82 total wins. Needless to say, that would be … a disappointment (can you imagine CubsCon next winter with that outcome, given all that’s happened lately?). Despite an ice-cold second-half of the season, which resulted in a .249/.339/.390 (90 DRC+) line, Willson Contreras projects to bounce back rather significantly by PECOTA standards in 2019: .253/.339/.415 (105 DRC+). Obviously, that’s well below our expectations for Contreras – and I would absolutely take the over – it’s hard to be mad at a 15% increase in production relative to the league average when that’s supposed to be a conservative model. Do I think Contreras will be closer to the 116 DRC+ he posted in 2017? Absolutely. In fact, I expect him to end up in the 120 range, if all goes well, but if we’re being honest, the increase he did see in the projections, special circumstances (overuse) or not, is simply not unfair. It’s not like the serious struggles last year didn’t happen. And consider Kyle Schwarber, who slashed .238/.356/.467 (111 DRC+) last season. PECOTA is projecting a slight increase in his batting average and subtle drops in his OBP and SLG percentage, but the total picture (112 DRC+) is actually a slight increase in offensive production overall. Once again, I believe strongly that Schwarber will outperform that forecast, but as far as conservative projections go, how can you scoff at an increase in production for a guy who struggled in the second-half and still has at least some questions regarding his ability to hit lefties? The same goes for Anthony Rizzo, who’s 2019 projected 131 DRC+ is better than what he posted last season (128 DRC+). And the same goes for Kris Bryant. PECOTA knows that the 109 DRC+ he posted last season was a fluke and is giving him a bump all the way up to 132 DRC+ for 2019. Given that, during his best seasons (2016 and 2017), he posted a 137 DRC+, that seems like an extraordinarily fair baseline prediction, right? I certainly think so. Now, that’s not to say we agree with everything on the offensive side of the ball. I doubt Ben Zobrist is going to drop from a 118 DRC+ to a 98 DRC+ without some major injury (which is not something you can bake easily into an algorithmic projection). And I think they have far too little faith in Javier Baez (108 DRC+ projected after a 120 DRC+ in 2018), even if they peg last season as his career best. But again, on the whole, it’s just not that crazy. I was really hoping to discover something else when popped under the offensive hood, but that’s the reality. With all of that said, these BP defensive projections are straight up woof (okay, I’m putting on my Cubs fan hat for a second here). In fact, I think I just have a problem with Fielding Runs Above Average (FRAA), in general. For example, I know Contreras is a very bad pitch framer, but in 2018 his -15.4 FRAA was the third worst AMONG ALL PLAYERS in MLB! Pitch framing is perhaps a disproportionately important skill that Contreras may well need to improve, but you’re telling me despite otherwise quality defense behind the plate and a rocket arm that his pitch framing makes Contreras basically the worst big league defender in baseball? I’m not really buying it. PECOTA is guessing he takes a slight step forward to -10.5 next season, but even that would’ve ranked as the 1,254th “best” mark in the game. Maybe some of you out there aren’t as high on Contreras’ defense as I am and are currently rolling your eyes because of how much of a Cubs homer I am. And to those people, may I present only one more fact: PECOTA is projecting Javy Baez to be a negative defender next season. Yep. At -1.8 FRAA, PECOTA thinks Baez will be something between average and poor, based on their guidelines, and you can go ahead and throw that straight into the garbage disposal. Indeed, as Brett has already highlighted, the Cubs defense, with the exception of Anthony Rizzo and Jason Heyward, is expected to be pretty awful across the board. I simply don’t think that’s right – and I think it’s a fair criticism, given how wonky advanced defensive metrics tend to be. 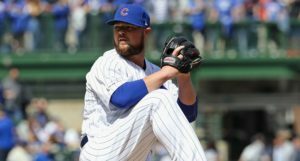 Defense is holding this group down – perhaps unfairly or incorrectly in certain cases – but at the end of the day, the offensive projections and improvements in the starting rotation just don’t look that crazy. The final win total – just 82 wins – feels terribly low, at a gut level, but we can’t ignore that a very, very competitive NL Central could hold down every team’s win total in the division. 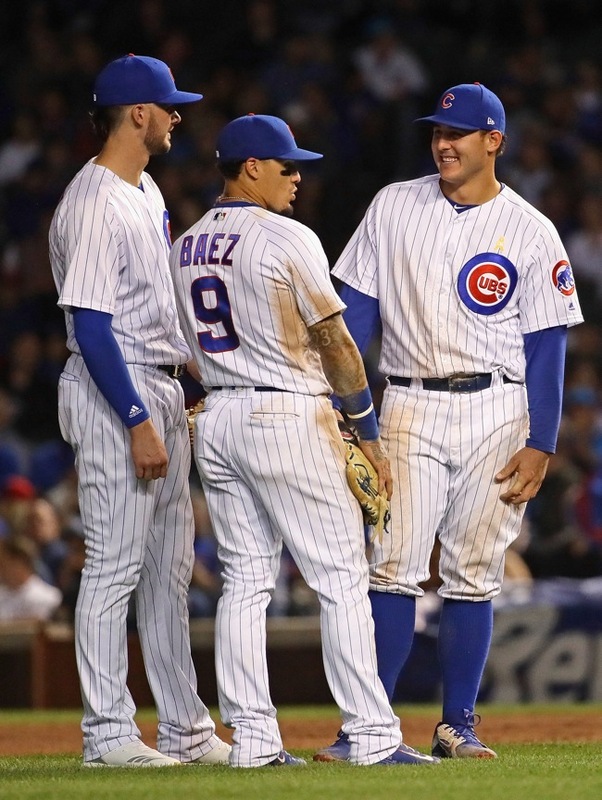 Aside from a few overs here or there and some corrections to defensive metrics (which together could add a few wins to the projection), this may well be who the Cubs are in 2019. Maybe they could stand to make another addition before pitchers and catchers report, eh?